Working in potentially life or death environments, you want to be sure that everything around you is as safe as it can be. That’s where EASL come in. This engineering consultancy company specialises in structural integrity and stress-analysis, walking their clients through the complicated processes involved. They identify any weaknesses within a structure and then provide the client with a workable, cost-effective solution, supported all the way by their highly-trained technical staff. In 2016 Ultimate were tasked with designing and building a website and brand that strongly reflected EASL’s closely-held brand values. EASL firmly believe that it is their willingness and ability to see a project from initial analysis through to solution, which sets them apart; along with the level of trust clients can put in them. They don’t walk away from an identified problem but rather stick with it until the end. The work they do is very niche but this needed to be portrayed in a positive light. EASL’s consultants are some of the best in the field due to their level of expertise and wealth of experience. This can only be beneficial to clients. Equally important is their ability to convey this knowledge plainly to clients in a way that makes it intelligible to them. The website needed to clearly explain all of their services, in a professional, authoritarian tone, but avoid being dull or overly technical. It also needed to portray all of the aforementioned brand values but maintain a strong and concise message. This balance also needed to be maintained in our overview of the brand as a whole. It was exceedingly important to EASL that our work demonstrated their commitment to building successful long-term relationships with clients, in which they ‘owned the problem’ from start to finish. EASL wanted to emphasise that the niche nature of their work translates into a high level of expertise and experience, very much a positive. EASL's work is deeply technical but they pride themselves on their communication skills, making complex concepts understandable to their clients. Their branding and website needed to be as clear and concise as themselves. The industry within which EASL operates can often appear to be dry, technical and impenetrable. They wanted to break the mould with a dynamic, crisp website which outlined all the services they offer. The website Ultimate has built is modern, simple and bold in appearance. It is well balanced to ensure that EASL’s expertise, abundance of experience and firm commitment is on display. Given that EASL is such a cutting-edge company, it made obvious sense to use a contemporary responsive design. Including a blog was fundamental as regular content is a key method for EASL to demonstrate evidence of their extensive knowledge. When designing and building the website we did so with SEO in mind. Our digital marketing team did extensive keyword research in order to inform strategy and content across the website. EASL’s services are highly technical and the language used can be confusing for those not in the industry. 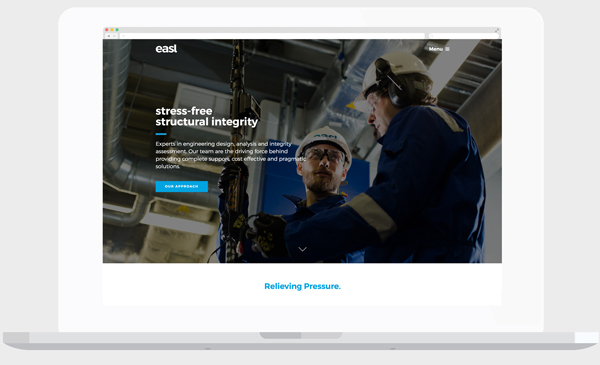 We advised EASL on how to use keywords, optimise their copy and structure their website pages in way that would improve the user journey and provide clarity. Beyond the website, we have applied their brand to various assets, including a brochure, pocket folder and case study template. Knowing that the brand would be used across various marketing tools, we ensured that the brand’s visual elements were flexible and scalable. The EASL site went live right on schedule in November 2016 and the initial feedback we’ve received has been highly positive. We are looking forward to seeing how the website develops and grows in 2017, now that it is more targeted and dynamic. Ultimate is continuing to work with EASL on further projects, helping them build up their brand.